I think it's evident that I'm madly in love with my cat. I spend much of my free time catering to his incessant whining for various things: an open window to yell out of, a lap to be petted on, breakfast, a snack for scratching his post, dinner. Much of Archer's life revolves around sleeping, my lap and meal time. When he's not getting those three basic needs filled, he's usually wreaking havoc. Archer's version of wreaking havoc is biting the leaves of my orchids in defiance. I have a ton of puncture wounds on my orchid leaves that look like stippling or pointillism. The thing that makes all of his playing, eating, sleeping, petting more difficult is that Archer is picky. He's picky about the toys he plays with, the way he likes to be petted, the angle at which he'd like to lay on your lap, and his food. He's an obnoxiously high-quality cat. He prefers my Pendleton blanket to my discounted West Elm throw. He prefers the $7.99 toys to the $2.99 toys. He’s constantly looking to be wow-ed (simple “okay” activities or toys won’t do). And he likes active play that involves us. No batting at a stationary feather or ball attached to a spring. We have to be up and moving for him to also be up and moving. After watching countless episodes of My Cat From Hell, Ben and I noticed that Jackson Galaxy is always recommending specific types of toys for quality cat playtime. Those are toys that mimic the motion of prey, like a bird flying through the air. The toys that Jackson sells online are well-priced, but we figured we could easily make one at home. The feather toy has been a giant success. It's only of the only toys that can actually wow Archer and get him running, jumping, and exhaust him until his next mealtime. You can also use it from a standing, sitting, walking, chore-ing place in the house. This toy is relatively simple to make and is great for an indoor cat. Read on for the DIY steps. Take your wire hanger apart and flatten it with the pliers until it is a straight piece of wire, about 1.5-2 feet long. You can either cut or fold up the end of the hanger to get this length. At the top end of the hanger, use your pliers to make a small loop (about a dime-sized loop) onto which you'll later tie your fishing line. Take about 5-7 feathers and tie them into a bunch with a piece of fishing line (uncut from spool). Be sure to secure them as tightly as possible. 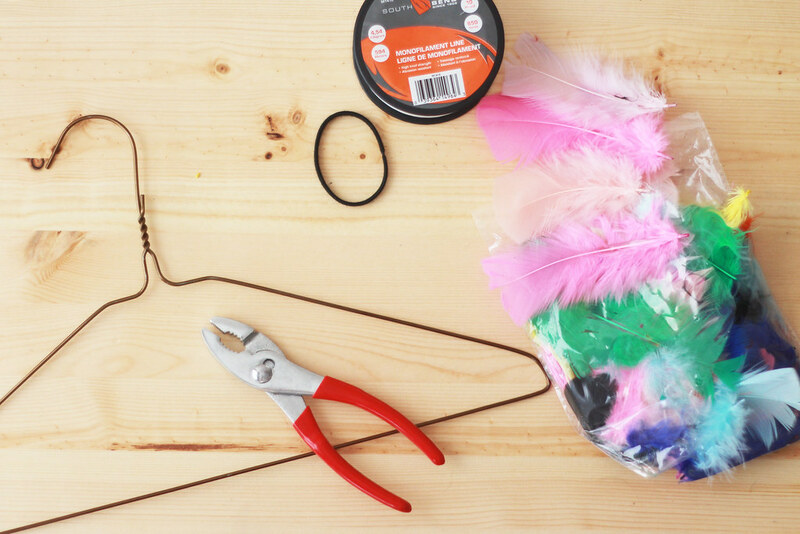 Over the fishing line, wrap a hair-tie around the feathers to further secure them. Trim the fishing line from the spool about 2-3 feet from your feather bunch and tie the end of the line to the small loop you created at the tip of the straightened hanger. 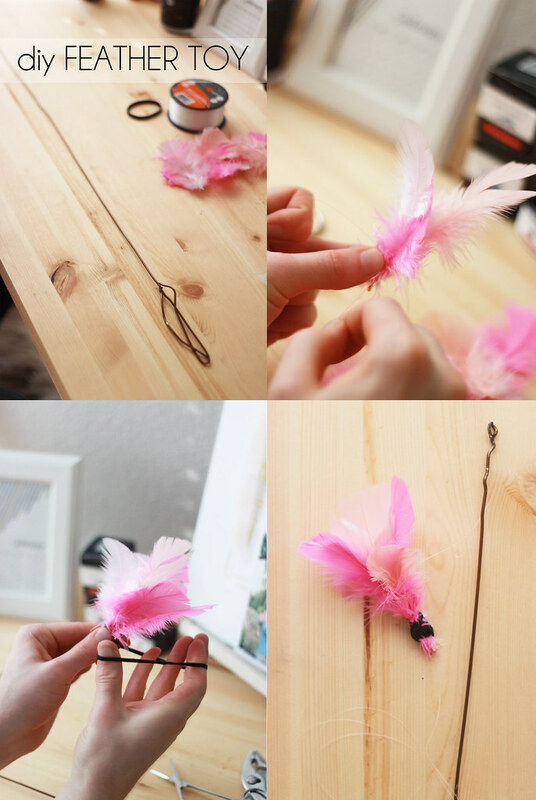 You should now have a straight wire hanger with a feather bunch hanging off of the tip. 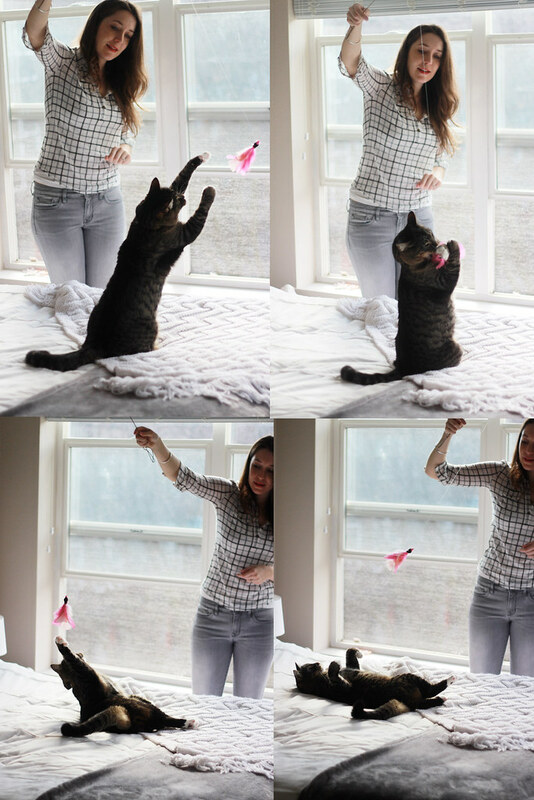 With a flick of the wrist, the fishing line and feather will fly through the air and look like a bird for your cat to chase! *You can find these feathers pictured in any craft store. I'd recommend looking for natural feathers that haven't been dyed as the dye, when wet, can come off on furniture and you don't want your cat to ingest any. 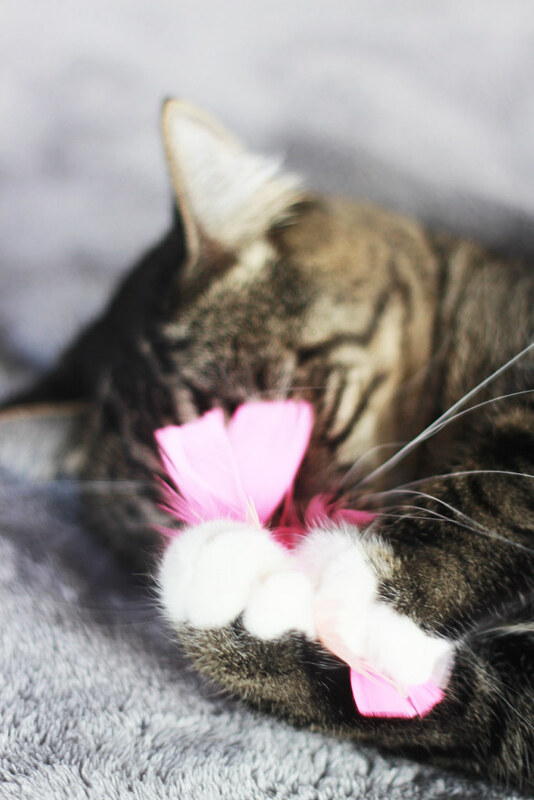 We usually take it away from our cat after play time so he doesn't lick the feathers. Post-play, Archer likes to lay about dreaming of dinner. 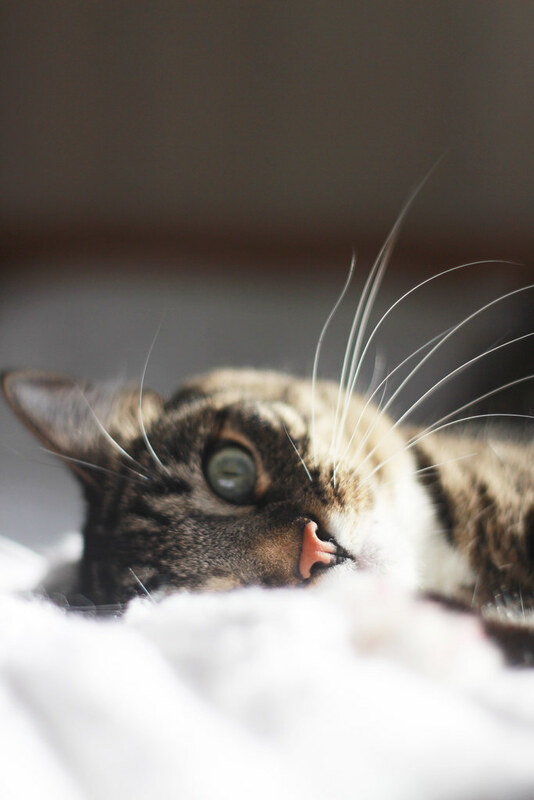 We think his life as a stray prior to our adoption of him drives his madness about mealtimes. If he's not yowling for a snack two hours prior to dinner, he's usually sick. 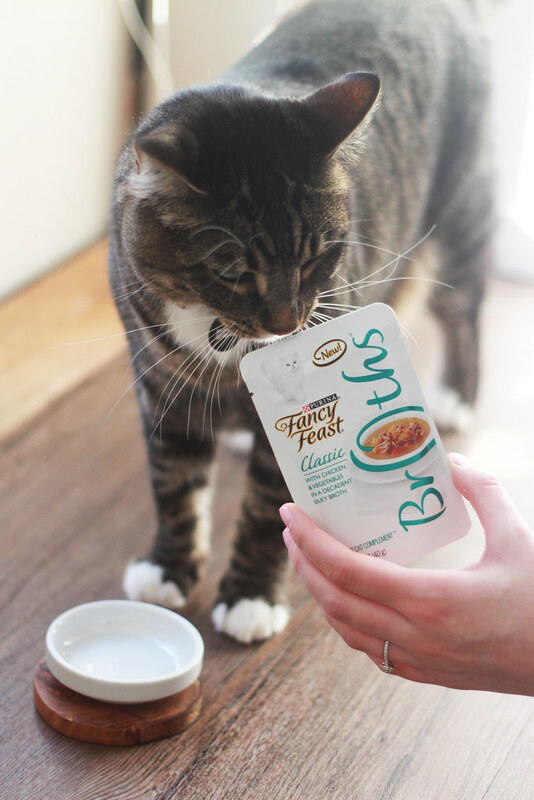 To tide him over, we have a few dry treats that we give him as rewards for using his scratching post, but in general he has to wait until mealtime for his dry food. He's such a picky eater that we're pretty limited on his food choices - everything has to be wholesome, not full of byproducts or fillers like corn. We've been entirely unable to get him to eat wet food, even when he's needed it for hydration, due to his distaste of brown mush (can't blame him!). 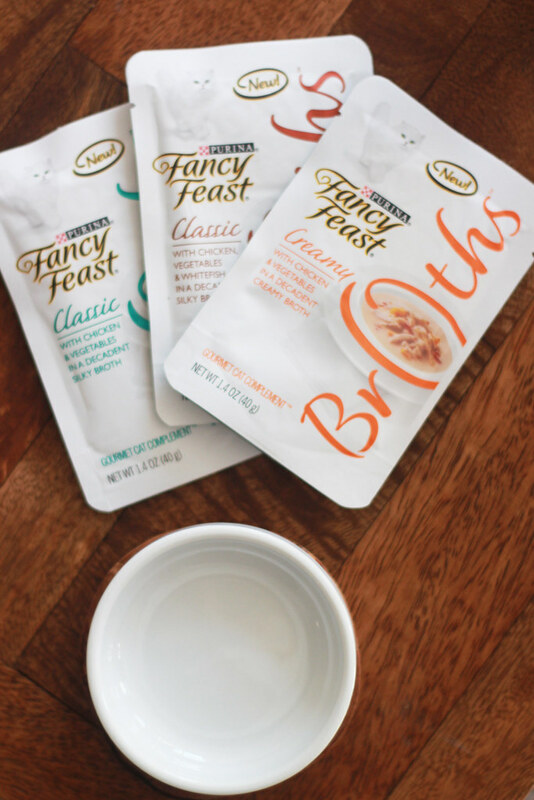 But, we recently got the opportunity to feed him some Fancy Feast® Broths as a complement to his daily dinners and were surprised to find that he was obsessed. 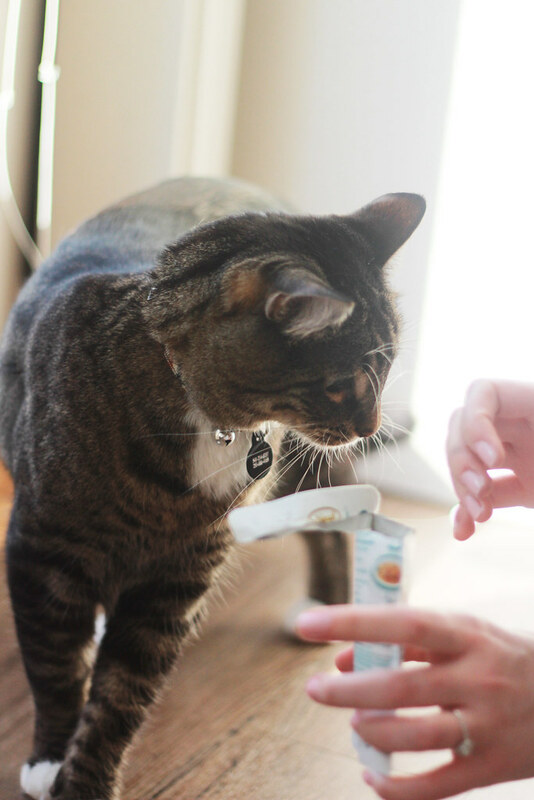 It’s seriously one of the best ways we’ve found to wow our cat! 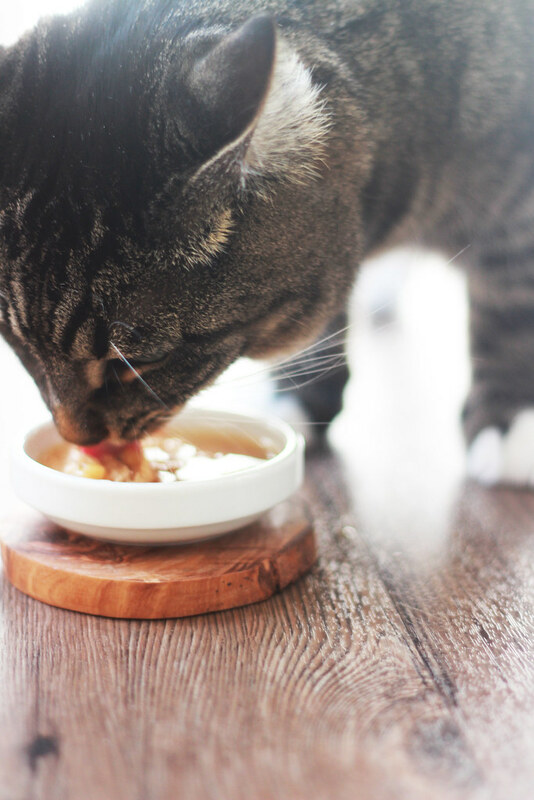 The broth has real, recognizable ingredients in it and he has gone a bit crazy for the chicken broths. I actually could hardly keep him off the dish for long enough to photograph him and now, when I open up any kind of pouch, he follows me around crying. I didn't own one right now since i'm from different city. I'm happy you made her toy. Archer is the cutest! 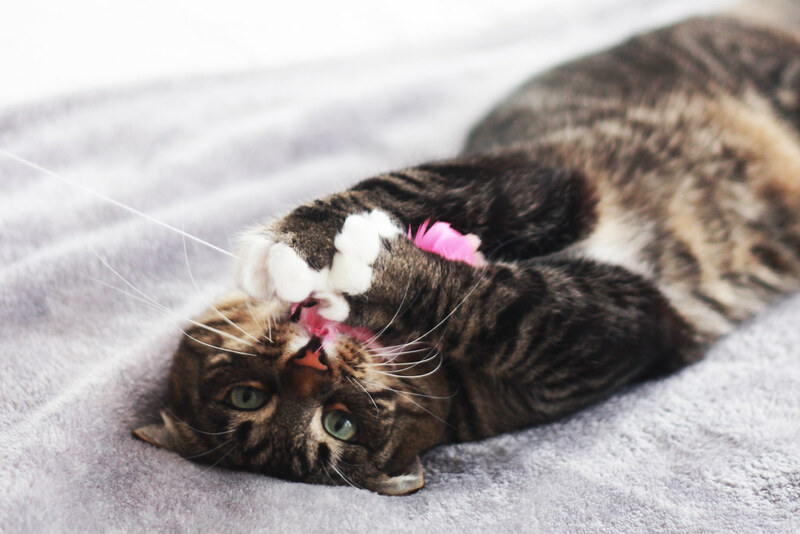 This DIY cat toy is so easy to make I'm mad I didn't think of it. 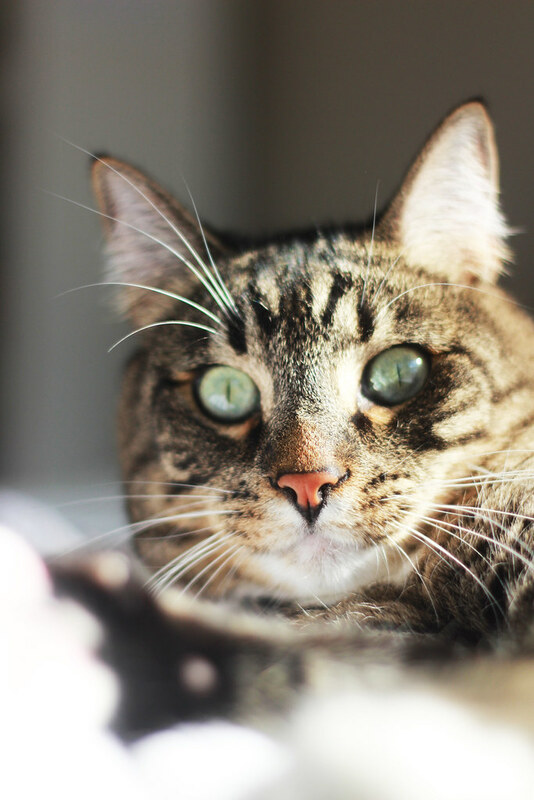 Oh my gosh, your cat photos are so cute! I love the ones where he's clutching the new cat toy. Your cat is soooo cute! Great idea! It is so fun to play with a cat!